2 years: 1st semester at SPbPU + 2nd semesters at LUT + 3rd semester at LUH + 4th semester at home university. Trilateral Degree program is performed in cooperation with Lappeenranta University of Technology and Leibniz Universität Hannover. The programme is designed to give a highly qualified specialisation in the field of Energy Technology. It is offered in English language by Leibniz Universität Hannover, Germany in cooperation with Peter the Great St. Petersburg Polytechnic University, Russia and Lappeenranta University of Technology, Finland. The sector of Energy Technology is increasingly characterized by international and multinational collaborations. Thus, besides the technical expertise international experience is demanded. 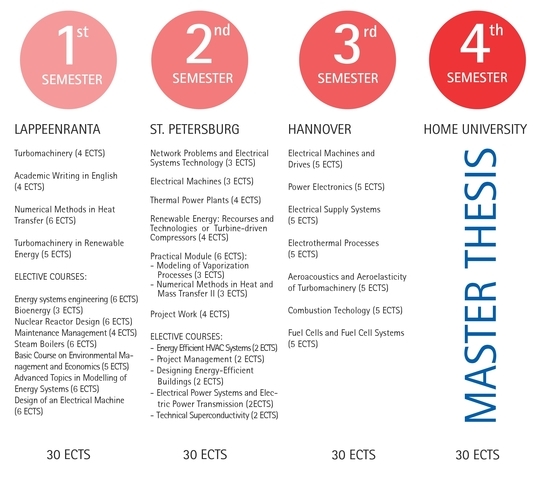 The master‘s degree programme ‚Energy Technology‘ is offered to meet these arising requirements of internationality. Technical expertise is taught in an international environment. The 1st semester takes place in Lappeenranta, the 2nd semester in St. Petersburg and the 3rd semester in Hannover. The Master Thesis can be written at the home University. In each semester the participants can recieve 30 ECTS in approved courses at each University following lectures held in English. In order to be eligible for this study programme, a bachelor degree in Mechatronics, Mechanical Engineering, Electrical Engineering, Information Technology or a related field of study is required. Applicants may apply to all three Universities as long as they hold an European bachelor degree or a degree from anywhere else except Russia. Applicants with a Russian bachelor degree may apply only at St. Petersburg. Entrance examinations should be taken at the university to which the student has applied. The application deadline is 31st May every year. The study programme can only be commenced in a winter semester. It starts on 1st September in Lappeenranta. The program prepares students to go on to careers as professionals and experts in the rapidly developing, multidisciplinary area of energy and the environment, or to continue their studies in doctoral programs.